I couldn’t help myself and named them Laura, Caroline, Mary and Grace. They’ll be up in my etsy shop at 11 today in the Handmade Originals section (if that section doesn’t show up on the sidebar then they’re sold out). 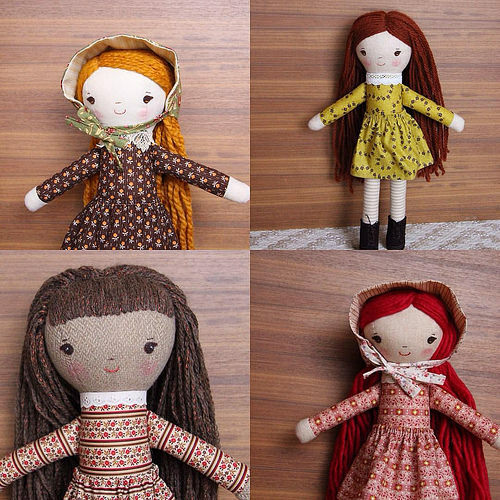 The Little House dolls are beautiful! I love your creations. Speaking of that, my daughter is thrilled with the Clara and Nutcracker from Land of Nod that you designed. I had hoped that you would make these available after seeing your original creation a few years ago. My ballerina daughter (who was in the Nutcracker this year) loved getting it on Christmas morning.